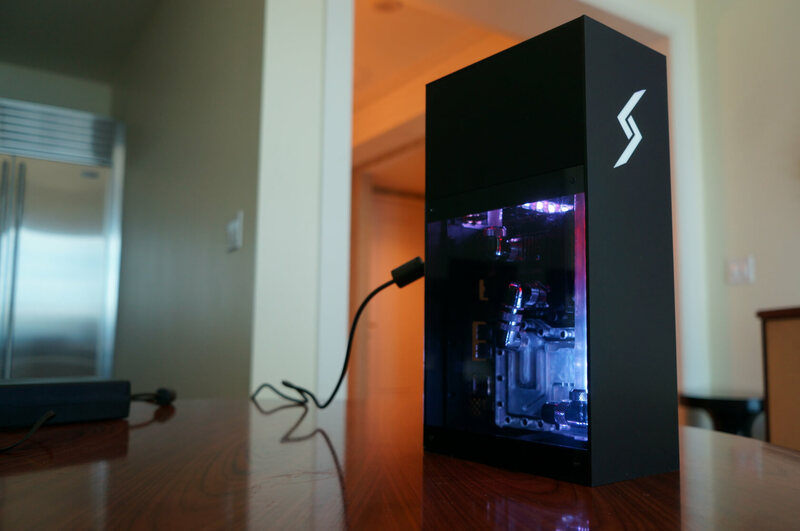 If you like big things that come in small packages, Digital Storm has a gaming PC just for you. As the first technology expo of the year, CES is the perfect time for the company to show off the newest addition to its line-up. Project Spark (probably just Spark after it goes on sale) is a small form factor (SFF) PC designed with gaming in mind. While Digital Storm did not reveal all of its specifications, from what was shown, it seems that Spark will be pretty close to the company’s other SFF offering, the Bolt. The most significant difference is in size. The Bolt uses the industry-standard Mini ITX form factor and measures 15.5 x 6 x 20 (L-W-H in inches). Spark uses the less popular MicroSTX form factor and has a 6 x 4 x 12-inch chassis. It’s just about the size of a shoe box but what is really amazing is everything they cram into it. Project Spark is powered by an Intel Core i7-8700K which we named "The New Gaming King" back in October. The 8700K runs at a baseline of 3.7GHz. However, Digital Storm overclocks all of its rigs so you can expect it to be running at around 4GHz or more. The starter unit will have a GeForce GTX 1060 but the MXM module allows you to upgrade it all the way to a GTX 1080. You can even buy it pre-configured with a 1080 if you want to pay extra. Things tend to get hot in SFF boxes anyway, let alone when you overclock them. No worries there, though, as Spark comes with a custom-built hardline liquid cooling solution that not only keeps the temps down but also looks damn cool. Internal storage is highly configurable with three M.2 SSD slots as well as a SATA 6Gb/s port. Digital Storm did not mention RAM configurations but using Bolt as the model, you can expect at least 8GB of 3000MHz DDR4 in the starter unit. Bolt can be configured all the way up to 32GB of RAM. Project Spark is currently in the prototype phase but Digital Storm expects to start shipping in Q2 2018. It will start at around $1,300 and go up from there depending on your configuration options. Even if you get the starter unit, Spark can be fully upgraded, just like all of Digital Storm's PCs.